Lea esta carta en español. We have completed a review of the circumstances leading to incorrect information being provided to some of our educators on visas and would like to share the results with you. First, I want to reiterate our deep appreciation for our educators on visas and all of our immigrant communities. I deeply regret the negative impact this misinformation had on our educators and communities and I know how important it will be for us to rebuild trust. DPS has over 100 immigrant bilingual educators working in our classrooms under H-1B visas and J visas. An employee in Human Resources works full-time to support the visa process for these individuals. This employee works directly with an outside law firm, Kolko & Casey P.C., to follow all requirements associated with the visa process. The law firm processes all individual cases for DPS employees who are working under an H-1B visa. After the DCTA voted to strike, many teachers on visas and their principals asked HR if the teachers could strike. In the [e]vent you have teachers on H or J visa that choose to strike we need to be informed as soon as possible as we are required to inform immigration and the department of state. If they have a pending case and choose to strike this could impact the decision on the case. I would advise any teacher inquiring about their personal situation to contact the immigration attorney or myself. They can seek advisement with regards to their personal situation directly from the attorney. She included her mistaken belief that our immigration attorney needed to be notified of the individual teachers on visas who chose to participate in a strike. This is not correct. The district is only required to notify the Department of Labor that a strike is occurring, not of any individual choices to strike or not strike. Between the afternoon of Jan. 22 and Jan. 23, this information was shared with several DPS school leaders. The HR employees never intended that an email would go directly to teachers. However, they did not take appropriate steps to safeguard that information or prevent school leaders from sharing it with teachers. 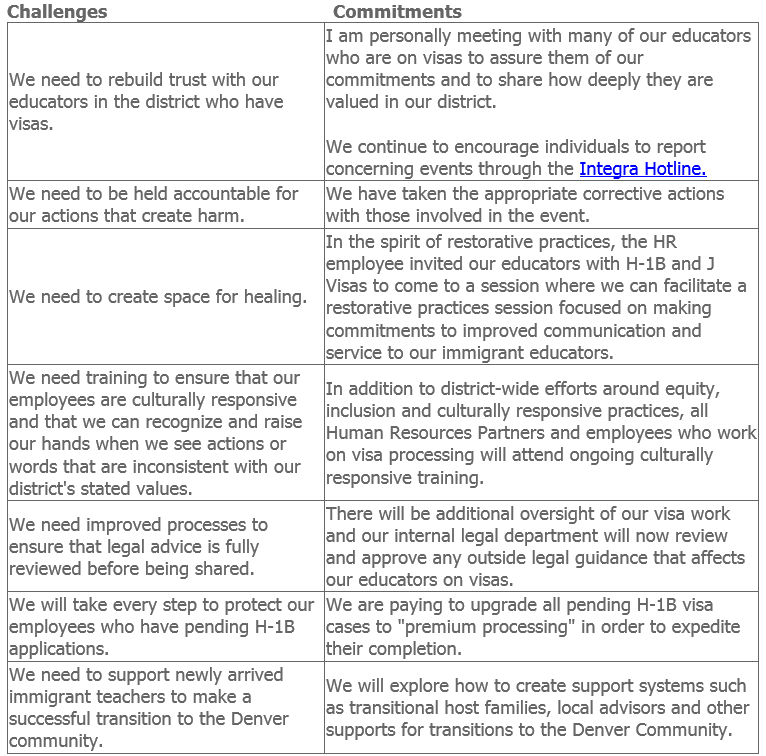 Two DPS school leaders shared it with several of their employees who are on visas so that they would know about the option to reach out to the immigration attorney. On the evening of Jan. 24, at the end of the School Board meeting, I was informed by a teacher about one of the emails that had incorrect information. I immediately instigated a review, which led to my statement and press conference to assure our employees that they can participate in the strike and that the information was incorrect. We are passionate about supporting our immigrant employees. For more than 10 years, DPS has supported immigrant teachers by sponsoring their visas, facilitating their employment and ensuring that their employment complies with all applicable legal requirements. We are deeply sorry for the negative impact that the release of this misinformation had on our immigrant teachers and communities. We are deeply sorry for the pain and anxiety that we have caused and hope that our communities can work with us to heal. We hope that everyone will join us in this healing effort and that these mistakes not be used as a means to create further fear and division among our employees and our communities. We are committed to learning from these mistakes and to repairing the fractured relationships that they have caused. If you ever have concerns about discrimination, harassment or retaliation (that you or someone else has experienced) you can share your concerns directly or anonymously through our Integra Hotline. We encourage all members of Team DPS and our community to take an active role in calling out any actions or words that do not align with our stated values.